My June vacation in Cornwall with Dacey’s Cornish Tours ended several weeks ago, and I’m reflecting back on my journey with memories of the beautiful scenery, blooming flowers and friendly people that characterize this region of southwest England. Cornwall is the land of writer Daphne du Maurier and current popular television series Doc Martin. Cornwall is also a land of fishermen, miners, pirate legends and historic sites. 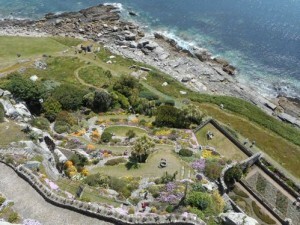 On the second day of the tour, we visited St Michael’s Mount. As we drove into the town of Marazion across the bay from the Mount, I got my first glimpse of the famous island with its castle perched on top. Low tide allowed our group to walk along the paved path and sand flats to reach the Mount. After I started walking up to the castle, I quickly realized what an effort it would be to reach the top! I thought about the people who walked this path before me, most specifically, the pilgrims and monks who climbed the steep pilgrimage stairs in the Mount’s previous life as a monastery connected to Mont-St-Michel in France. At the top of the Mount, I toured the public rooms in the castle and the Church of St Michael and All Angels. However, I most enjoyed gazing over the castle ramparts to take in the stunning view. Cannon perch on the hillside as a reminder of Oliver Cromwell’s invaders. Two sides of the ramparts overlook colorful sub-tropical gardens. Ships passed in the distant ocean lane. 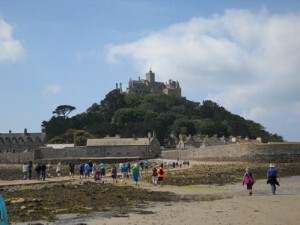 Walking back down the pilgrimage steps and over the sand flats to Marazion, I reflected on this awesome Cornwall landmark, now a National Trust property but inhabited by the 12th generation of the St Aubyn family to live on the Mount. 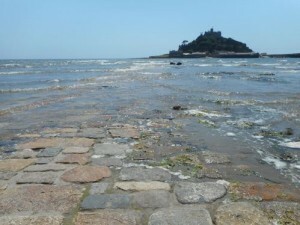 The mid-afternoon tide made the footpath inaccessible, isolating the Mount from the mainland and preserving its mystique. Now back at home, sorting through souvenirs and photographs, I am reading my St Michael’s Mount guidebook and fondly remembering this amazing place.